General Plastics’ LAST-A-FOAM® FR-4700 High-Temperature Tooling Board Series has been a proven performer since its introduction in 2011. These rigid, high-density epoxy-urethane tooling boards hold up under peak temperatures up to 400° F (200°C) and continuous-use temperatures up to 350° F (177°C). Their particular thermal and physical properties make them suitable for critical tooling applications, such as production of advanced composite parts under high processing temperatures and autoclave curing. The unique properties and characteristics of this hybrid urethane foam tooling board deliver many benefits. Affordable and dimensionally stable, FR-4700 HT is optimal for prototype machining, high-temperature curing prepregs, vacuum form tooling, tool proofing, pattern making and master model making. It is especially cost-effective for monolithic or large-mass tools compared to traditional metal dies. Here are key qualities, considerations, recommendations and resources associated with using this material. 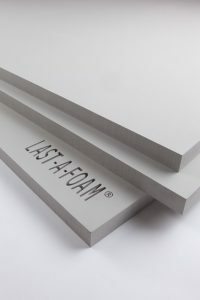 Our flame-resistant high-temperature tooling foam can be used in autoclave conditions up to 400ºF and 90 psi, and it’s compatible with commercial prepregs. It machines easily and produces an excellent surface finish. Unlike most other manufacturers’ products, it’s offered in a lighter-weight 18-pound density as well as the heavier 30-pound and 40-pound densities. So, for prototyping, one-offs and short runs where durability isn’t critical, the FR-4718 offers a lower cost, and it’s less expensive to ship the material or finished tools. It’s also easier to handle, making it easier to move around and machines faster than the higher densities. If you need a greater number of pulls, you’ll want the denser, tougher material that’s more resilient to repetitive wear. These boards are also available in larger block sizes than others on the market, which means fewer bond lines and lower labor costs associated with bonding blocks together. General Plastics also has the ability to customize it on a batch basis, and we can adjust the foam properties for specific needs. Like all of our tooling foams, this series is known for outstanding dimensional stability through thermal cycles. Other foam materials can cause wrinkles or waves in the prepreg fabrics or other irreversible dimensional changes when they undergo repeated thermal cycles due to density variations and defects in the surfaces. The FR-4700 remains stable and uniform during processing. While running this material in an oven or clave, it’s important to carefully control the temperature gradient during the cool down when using larger cross-sections (sheets thicker than 4 inches). The FR-4700 is also frequently preferred for its predictable Coefficient of Thermal Expansion (CTE): 75ºF-400ºF – 27×10-6 in/in*ºF and 24ºC-205ºC – 46×10-6 m/m*K. When modeling dimensions for a part, this predictable CTE makes it easier to compensate for the peak expansion, such as when a composite laminate begins to cure. Our high-temperature tooling boards are fully cured, ready to use and contain no fugitive components like catalysts or blowing agents to volatize and cause outgassing in the process. All of the components are cross-linked, reacted and bound into the polymer matrix so they won’t outgas in applications that require heating. The FR-4700 high-temperature tooling boards work well with a variety of adhesives, sealants and mold release agents. In particular, we recommend the Airtech /Tooltec® CA5 adhesive release films, which are easy to use and deliver a consistent, controlled surface. Pagni says that while they’re designed specifically for high-temperature applications, they can be used for lower-temperature applications as well. “For surface other surface sealing and filling options if you’re curing at temperatures lower than 275ºF, there are several solvent-based, acrylic resins and vinylester resins that you can potentially use. Just refer to our LAST-A-FOAM® Tooling and Molds User Guide,” said Pagni. For more features, size options and information on physical and thermal properties, download the FR-4700 product data sheet. Additional technical data can be found in the technical data sheet.